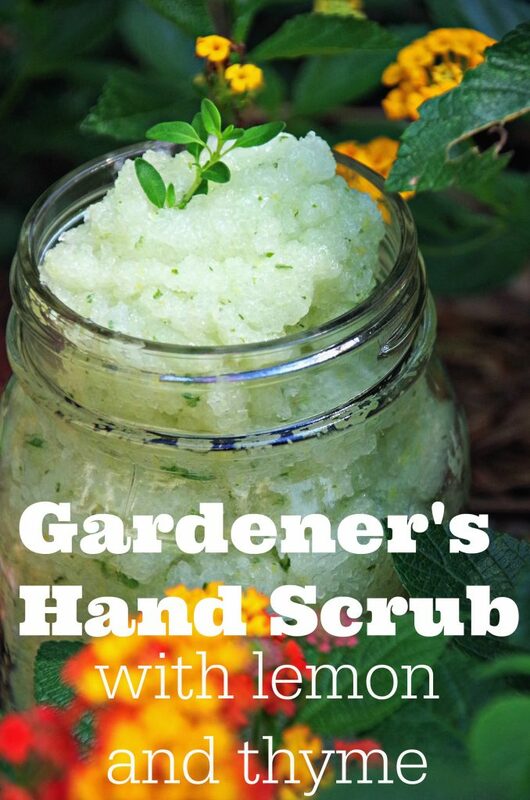 This gardener hand scrub recipe will help any gardener tackle the hand mess that happens while playing in the dirt. While there are a lot of things I love about Georgia, the red clay soil is NOT one of them. Sweet tea is awesome. Peaches are delicious. Red clay soil stains socks, gets tracked in on dog paws and leaves your hands a mess after you go outside to pull up weeds from the garden! I decided to tackle the Georgia clay with a homemade hand scrub recipe and since I had a ton of fresh herbs, I went with a lemon and thyme variety. 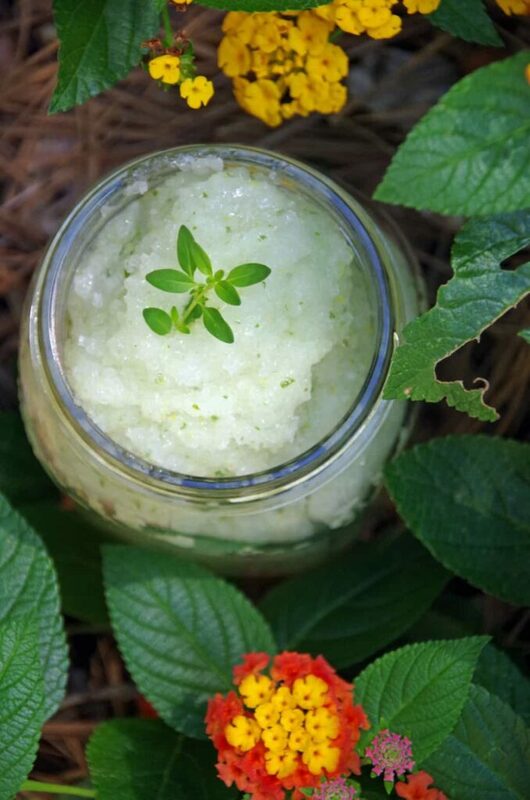 So, what’s the difference between a gardener hand scrub recipe and a body scrub? Hands are much rougher than the skin on the rest of your body and you can use a harsher abrasive. This salt scrub recipe is rougher on the skin, which is great for getting rid of unwanted dirt but might be too harsh for tender arms and legs. You could use it on the rest of your body but definitely rub very gently. The other big difference between this gardener hand scrub and a traditional sugar scrub is that it contains liquid soap. This is a huge help when cleaning off really dirty hands and your hands won’t be left feeling too oily. That makes opening jars and door handles much easier! If you have any friends or family members who enjoy playing in the dirt, this would make a great gift for gardeners. Inexpensive to make as well, which is always nice! Check out my Amazon affiliate link for other gifts for gardeners that your recipient might enjoy! Add the essential oil if desired. Place in a jar with a screw cap lid for storage. Should the gardener hand scrub be kept refrigerated? How long does it last before the fresh ingredients start to "expire?" Thanks! I used mine quite regularly for 2 weeks at room temperature with no problems!